In rapidly developing economies, untreated wastewater is a serious and growing problem. Untreated wastewater impacts human health and well-being, economic growth and ecosystems. The poor and vulnerable are often most at risk. Sustainable Development Goal (SDG) 6.3 aims to improve water quality by reducing pollution, eliminating dumping, and minimising the release of hazardous chemicals. The Government of Bangladesh is working to meet the indicators of success for this goal, which include halving the proportion of untreated wastewater. 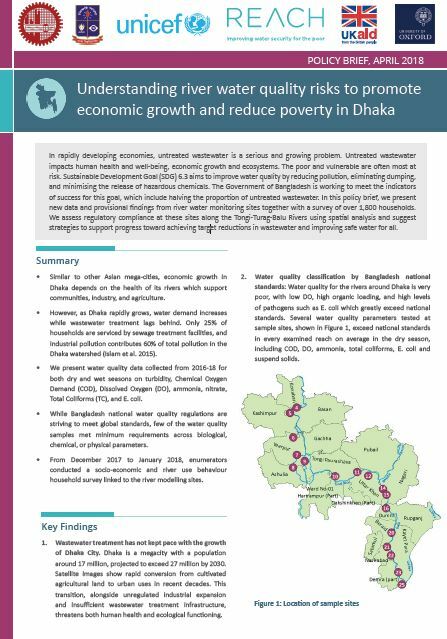 In this policy brief, we present new data and provisional findings from river water monitoring sites together with a survey of over 1,800 households. We assess regulatory compliance at these sites along the Tongi-Turag-Balu Rivers using spatial analysis and suggest strategies to support progress toward achieving target reductions in wastewater and improving safe water for all.